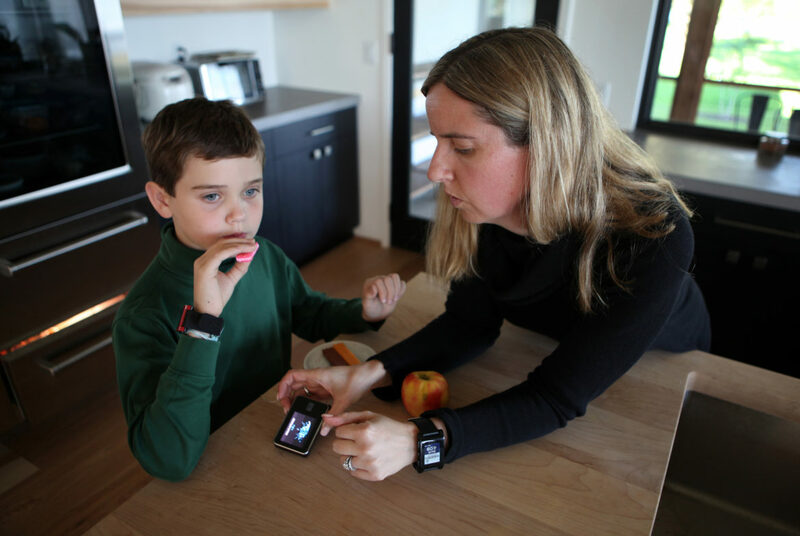 Jack Christensen, 8, has an after-school snack at his home in Waunakee, Wis. His mother, Jess Franz-Christensen, logs his carbohydrate intake on a monitoring device. Jack has Type 1 diabetes. 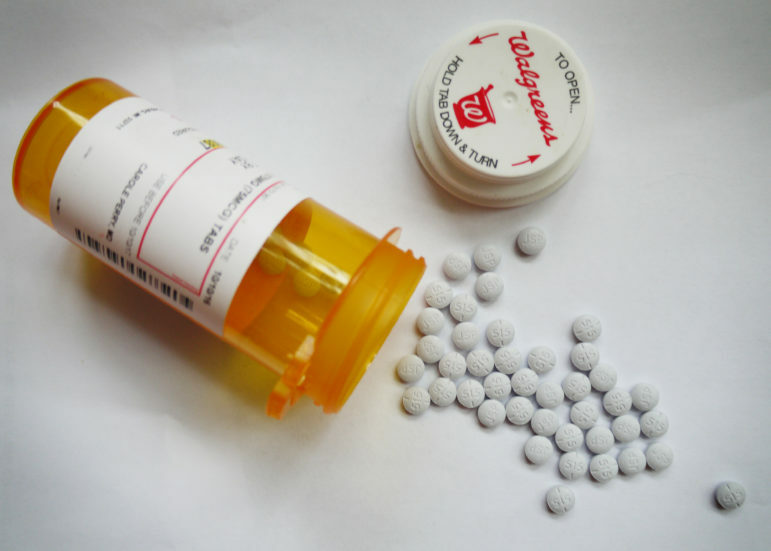 An investigation by Wisconsin Health News, the Wisconsin Center for Investigative Journalism and Wisconsin Public Radio found the cost of seven widely prescribed drugs has risen between 29 percent and 5,241 percent since 2011. Photo by Coburn Dukehart of the Wisconsin Center for Investigative Journalism. 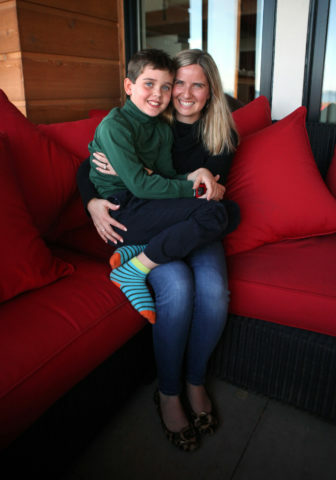 Jess Franz-Christensen did not realize the seriousness of her son’s Type 1 diabetes diagnosis until staff in the doctor’s office offered to call an ambulance to take him to the hospital. Her next shock: The cost of Jack’s medicines. Two bottles of insulin are seen at the home of Jack Christensen. Humalog, left, costs about $400 a bottle and Novolog, right, costs about $300 a bottle, his parents said. Jack uses three to four bottles of insulin a month. 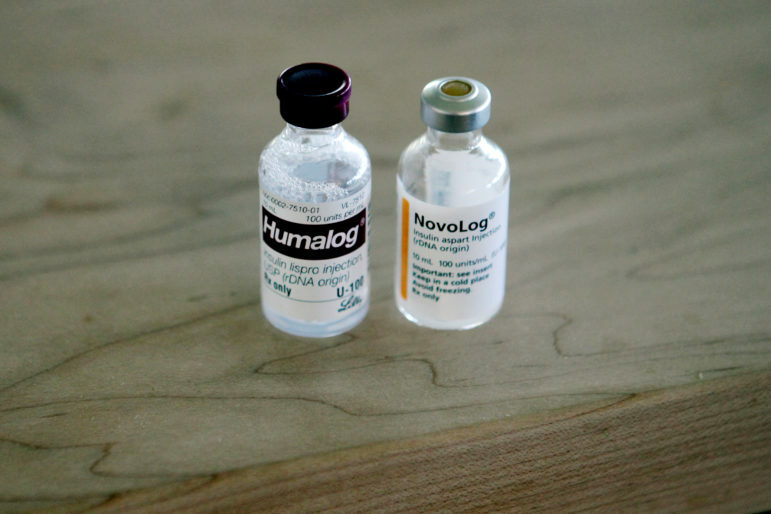 Without insurance, the family estimates they would have to pay between $15,000 to $30,000 a year for insulin. Photo by Coburn Dukehart of the Wisconsin Center for Investigative Journalism. 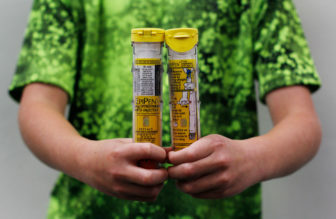 Jack Miller, 10, holds a two-pack of his EpiPen prescription. He has a severe tree nut allergy, and has to keep an EpiPen with him at home, school and in the car at all times. His brother also has severe allergies. His family spends thousands each year to keep multiple packs of EpiPens on hand. Photo by Coburn Dukehart of the Wisconsin Center for Investigative Journalism. 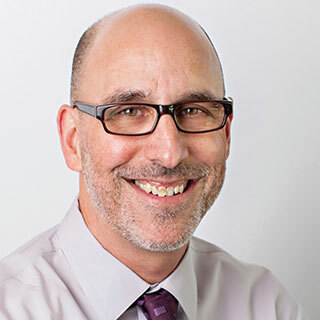 Larry Levitt is Senior Vice President for Special Initiatives at the Kaiser Family Foundation. “I don’t think I’ve ever seen the level of public concern like we have now,” he said. Photo courtesy of the Kaiser Family Foundation. For instance, he noted that an EpiPen competitor temporarily ceased productionafter a complete recall of its product. Levitt also pointed to the pharmaceutical company Valeant, which raised the price of two cardiac care drugs by 525 percent and 212 percent shortly after acquiring them. 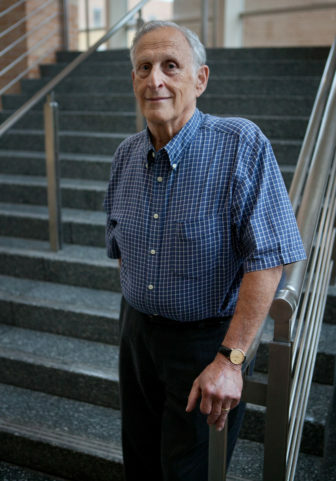 Mel Weinswig, professor emeritus and former dean of University of Wisconsin-Madison School of Pharmacy, says, “You have drugs that used to be pennies that are now selling for a dollar a capsule.” Photo by Coburn Dukehart of the Wisconsin Center for Investigative Journalism. 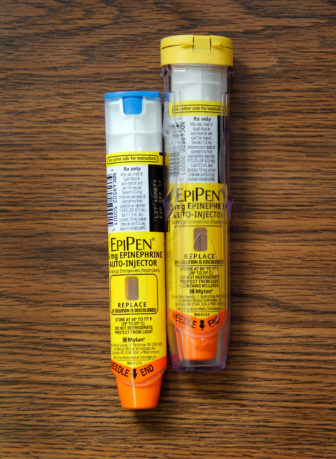 EpiPens are self-injectable devices that contain epinephrine. The auto-injectors counteract potentially life-threatening allergic reactions. 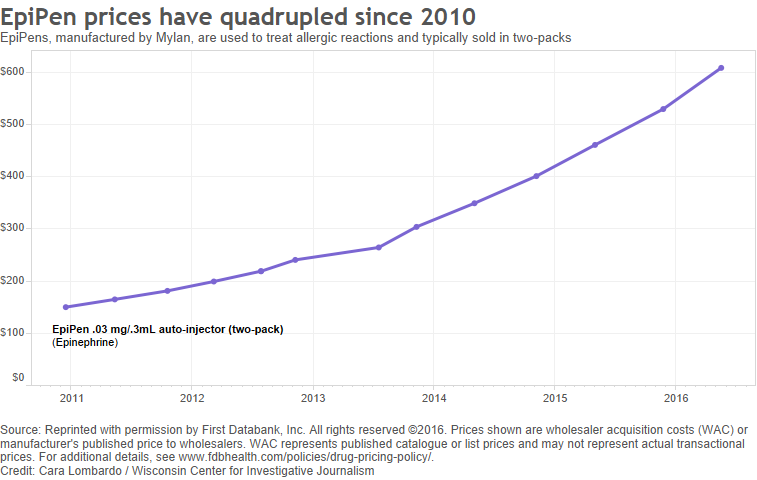 EpiPens, which come in packs of two, have risen sharply in price and now retail for about $600. Photo by Coburn Dukehart of the Wisconsin Center for Investigative Journalism. 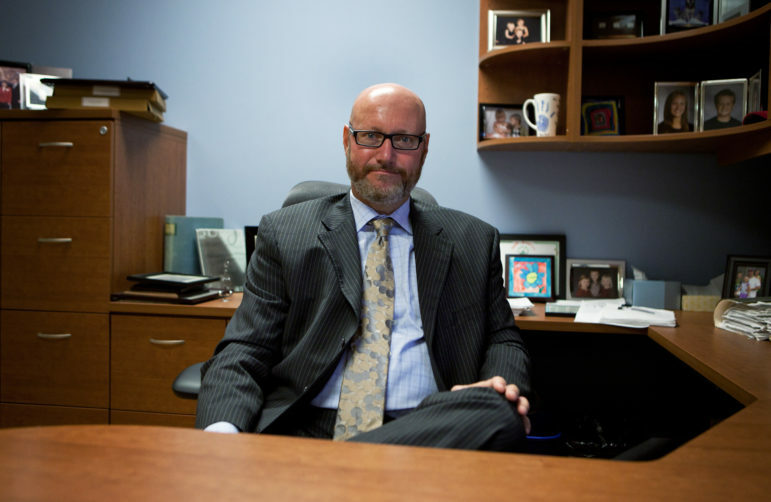 Dr. Tim Bartholow, vice president and chief medical officer of WEA Trust, says the nonprofit insurance company serving Wisconsin public employees has seen prices of individual drugs increase by up to 800 percent since early 2013. “The sad part of the … price increases is that I’m not aware of any improvements to the products, just ever increasing prices.” Photo by Coburn Dukehart of the Wisconsin Center for Investigative Journalism. 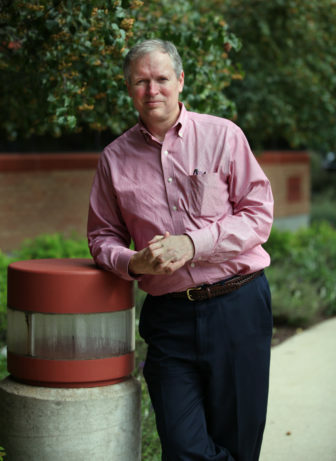 Steve Rough, director of pharmacy and clinical associate professor at the University of Wisconsin Hospitals and Clinics, says prescription drug price increases cost the health care organization $14 million in the past year. Photo by Coburn Dukehart of the Wisconsin Center for Investigative Journalism. 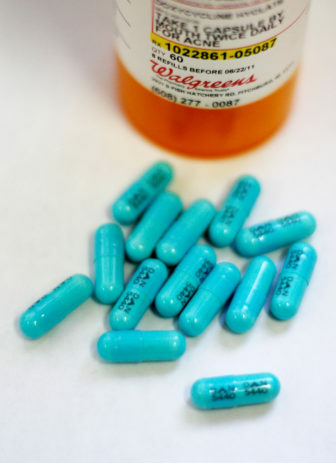 Levothyroxine, a generic drug used to treat hypothyroidism, has risen dramatically in price in recent years. The cost is now 231 percent higher than in 2011. Photo by Dee J. Hall of the Wisconsin Center for Investigative Journalism. Dr. Marcus Cohen, an allergist-immunologist in Madison, says patients at a free clinic where he volunteers often cannot afford their prescriptions. He says he was shocked to discover EpiPens cost the uninsured $600 for a two-pack. 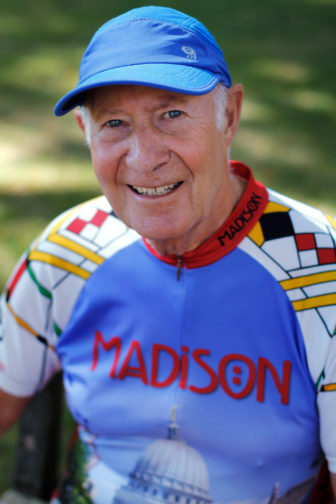 He calls the price “ridiculous” since the main ingredient, epinephrine, “has been around forever.” Photo by Coburn Dukehart of the Wisconsin Center for Investigative Journalism. Doxycycline is an antibiotic used to treat many different bacterial infections, including acne, urinary tract infections, intestinal infections, eye infections, gonorrhea and gum disease. The cost of the drug, which has been approved for use since 1967, is nearly 30 times higher than it was in 2011. Photo by Coburn Dukehart of the Wisconsin Center for Investigative Journalism. 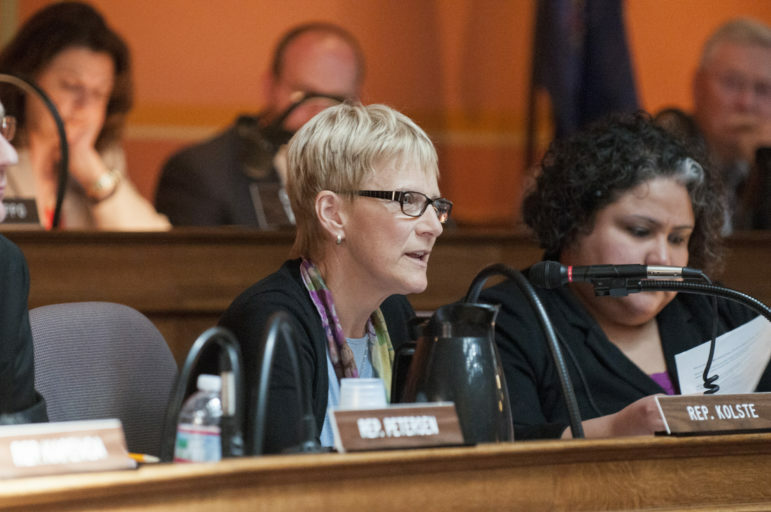 “Prices don’t occur in a vacuum,” said Rep. Debra Kolste, D-Janesville. “These are taxpayer dollars that are going to pay for these drugs, and it’s not a never-ending source of revenue.” Photo courtesy of the office of Debra Kolste. 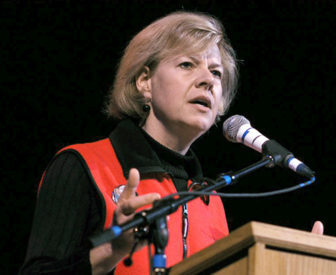 Sen. Tammy Baldwin, seen in this file photo, has introduced legislation requiring drug companies to alert the federal government before increasing a product’s price by 10 percent or more. Photo courtesy of the office of Tammy Baldwin. Jack was diagnosed with Type 1 diabetes at the age of 4, and requires copious amounts of medical supplies, including an insulin pump, insulin and related monitoring and testing equipment. He is seen here with his mother, Jess Franz-Christensen. Photo by Coburn Dukehart of the Wisconsin Center for Investigative Journalism. By Sean Kirkby, Wisconsin Health News, Dee J. Hall, Wisconsin Center for Investigative Journalism, and Bridgit Bowden, Wisconsin Public Radio. Cara Lombardo and Andrew Hahn of the Wisconsin Center for Investigative Journalism contributed to this report. Sean Kirkby reports for Wisconsin Health News, an independent, nonpartisan, online news organization serving Wisconsin health care professionals and decision makers. Dee J. Hall is managing editor of the Wisconsin Center for Investigative Journalism. Bridgit Bowden is a reporter for Wisconsin Public Radio. The nonprofit Center (www.WisconsinWatch.org collaborates with WPR, Wisconsin Public Television, other news media and the University of Wisconsin-Madison journalism school. All works created, published, posted or disseminated by the Center do not necessarily reflect the views or opinions of UW-Madison or any of its affiliates. Below are 60 of the 3,445 Google searches from the last month that resulted in traffic to an article about how to take matters into your own hands when you can’t afford insulin. ​It’s reckless. It’s dangerous. And unfortunately, it’s necessary to prevent death due to lack of insulin.